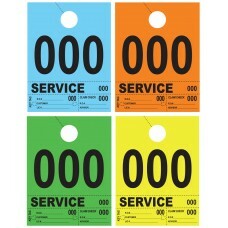 Service Department Hang Tags are used to provide a unique identification number where there is a matching number for a key tag, a claim check, and a hang for the rear view mirror of the vehicle. 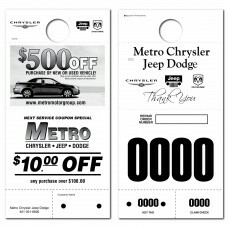 These tags serve the purpose of helping to keep your dealership's service department organized and running efficiently. The most popular option is our RL78, which is made from the traditional 100lb manila stock with green copy on one side and red copy on the other side. The 3DNR is also made from 100lb stock and comes in red, blue, green, white, and yellow. 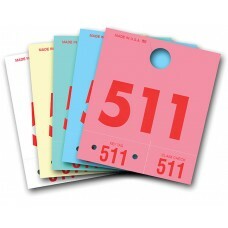 These are printed with red ink on both sides and have three-digit numbering. 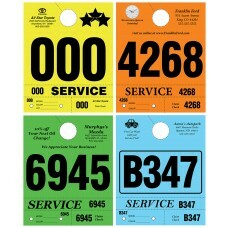 These are often used by dealerships when color-coding for the different service teams is required in addition to the identification numbering. The HSSP is used when maximum strength and durability are required. These are made from 125lb stock and come in either three or four digits. 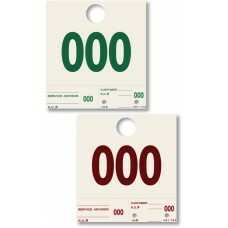 They are printed with red on the front and green on the reverse side. The 261 gives more options for colors as it is offered in 11 stock colors. 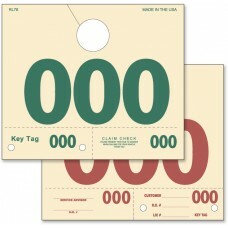 These are unique that in addition to the hang tag plus two key tags, it also has a marker that can be included with the file for the paperwork. These are only one-sided.